Hawai‘i County Mayor’s Office announced that over one million motor vehicle tires are imported into Hawai‘i each year, according to a fact sheet on the State of Hawai‘i Department of Health’s website entitled “How to Manage Your Scrap Tires.” Consequently, a large number of scrap tires are generated when new tires are installed. 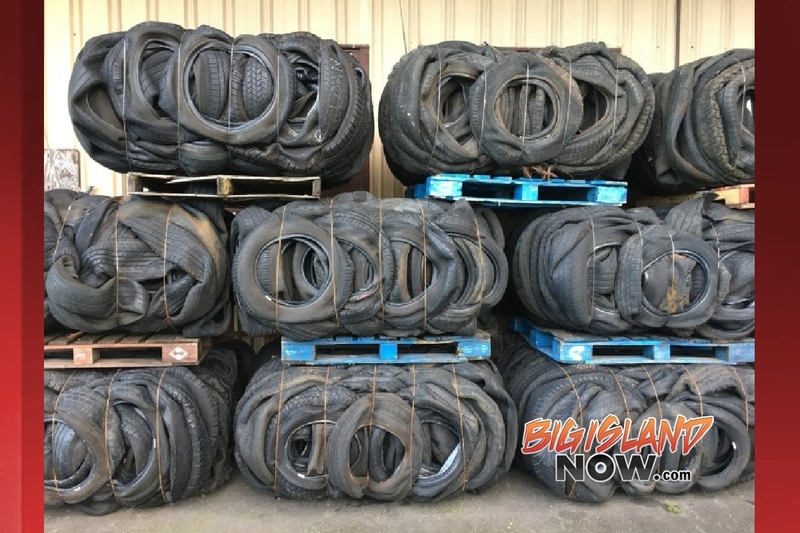 Hawai‘i law (Hawaiʻi Revised Statutes, Chapter 342I, Part II) requires a tire retailer to charge a disposal fee for each new tire purchased, even if the customer chooses to keep the old tire. The intent of the law is to decrease the health risks from tires by reducing the number of scrap tires in the community. Scrap tires may collect water which can contribute to mosquito borne diseases, or they can catch fire and create toxic smoke. The Hawaiʻi County Code also prohibits disposal of tires in landfills or transfer stations. It is estimated that more than 50% of scrap tires from the island of Hawai‘i are used to generate electricity in waste-to-energy plants or heat for industrial uses. Most scrap tires are utilized to generate energy on O‘ahu, the U.S. mainland and in foreign countries. The United States Environmental Protection Agency’s 2010 publication, entitled, “Scrap Tires: Handbook on Recycling Applications and Management for the U.S. and Mexico” states that 54% of scrap tires generated in 2007 were used as fuel, and only about 17% were processed into ground rubber and utilized to make many creative products. Scrap tires are also recycled to make a wide range of products that include recreational court surfaces, rubber mats, mulch, fill material, rubberized asphalt, traffic cones and even furniture. The County of Hawai‘i’s Department of Environmental Management used scrap tire crumbs as ground cover at some of the county’s recycling and transfer stations. The county is unaware of any current on-island producers of used tire content products. For information about recycling scrap tires on the Island of Hawai‘i, go online. For inquiries at the county level, email swd@hawaiicounty.gov. Since early July, Hawai‘i Wildlife Fund (HWF) and volunteers have been working to fill a 40 ft. Matson container with blue and white plastics for an architecture couple in Brooklyn, NY. Jason Klimoski and Lesley Chang of StudioKCA plan to build a 30 ft. blue whale sculpture made entirely out of the collected plastic marine debris. The whale sculpture will be installed as part of a triennial event in the town of Bruges, Belgium in May 2018. Jason Klimoski (5th from top right) and Lesley Chang (3th from bottom right) of StudioKCA and Hawai‘i Wildlife Fund Collection Team volunteers from Innovations Public Charter School in Kona. Photo by Alejandro Durán / WashedUp Project. “The Bruges Whale is meant to spark conversation and raise awareness about the tremendous amount of plastic waste that is ending up in our oceans, hopefully helping the nearly 2,000,000 anticipated visitors reconsider what and how we consume, package, and dispose of plastic” said Jason Klimoski, StudioKCA. Jason adds, “Special thanks to Hawai‘i Wildlife Fund for their tremendous effort over the course of the last several months, helping us collect blue, white, and grey plastic to build ‘Skyscraper’, or ‘the Bruges Whale’ for the 2018 Bruges Triennial”. In total, 17 Hawai‘i Island cleanup events were coordinated by HWF to fill the shipping container with approximately 3,000 lbs. of plastics while it was stationed at the Wai‘ōhinu Transfer Station in Ka‘ū. Additionally, Surfrider Foundation volunteers on Kaua‘i collected 1,000 lbs. of plastic debris that were added to the container once it reached Hilo courtesy of a Young Brothers gratis-shipping grant that was received by HWF. Matson Navigation was another supporter of the project by extending the time allowed to fill the container for free. Kona Trans also provided StudioKCA with a discounted hauling rate for the project and the County of Hawai‘i’s Department of Environmental Management provided HWF space to store the 40 ft. container for 12 weeks as volunteers contributed to fill it with plastic debris, making this effort an especially collaborative project by local businesses and residents alike. The container will ship from Hilo on Oct. 4, to begin its journey to New York, and later Belgium. “We are thrilled to able to work with artists to create awareness installations, like this Blue Whale project, and simultaneously divert some of this plastic pollution from our island landfills. Since 2003, HWF and volunteers have removed nearly 225 tons of debris from the shores of Hawai’i Island. Whatever cannot be recycled, generally ends up in landfills. Innovative projects that include re-use, art, research, and recycling are always preferred!” said Megan Lamson, HWF Hawai’i Island Program Director. HWF is a small nonprofit conservation organization founded in 1996 to conserve native wildlife. During its 21-year existence, HWF and volunteers have removed a total of 260 tons of marine debris from the shores of Hawai’i Island (86% by weight), Maui, Midway and the French Frigate Shoals. In 2017 alone, HWF and volunteers have removed 63,343 lbs. of marine debris from Hawai’i Island & Maui during 51 community cleanup events. The majority of HWF’s marine debris removal work is conducted by volunteer labor, with financial support from the federal government (NOAA’s Marine Debris Program), local businesses (Matson Navigation, Kona Surf Film Festival, Kona Brewers Festival, Norwex, etc. ), and individual donations from around the world. If you would like more information on the project or how to get involved with HWF, please contact them at kahakai.cleanups@gmail.com or at 808-769-7629 or check out the HWF website at www.wildhawaii.org. For information about Jason Klimoski and Lesley Chang of StudioKCA, visit www.studiokca.com. UPDATE – Just received a call from Kona Trans and the corrected scale weight of the “blue whale” debris plastics in the 40′ container is actually 19,212 lbs. (we had super underestimated at 4,000 lbs.!!). 9.5 tons of marine-debris plastics from Hawai’i Island and Kaua’i are shipping to Brooklyn from the port of Hilo tomorrow. Living on the Big Island offers many benefits such as diverse climates, rich cultures, and unmatched views. However, Hawai‘i County as an island with finite space poses major solid waste management and recycling challenges. With the help from the County of Hawai‘i recycling staff, County intern Taylor Reid uncovered some key trends and patterns that could lead to solving the unique recycling and solid waste management problems facing the Big Island. Reid conducted a survey at the County’s Refuse Transfer Stations, to which 195 people responded. 98% of respondents “agree” or “strongly agree” that recycling is important for Hawai‘i. 91% of respondents “agree” or “strongly agree” that they try and recycle whenever possible. 78% of respondents “agree” or “strongly agree” that recycling should be mandatory for Hawai‘i. The survey also revealed that only 18% of transfer station users have visited www.hawaiizerowaste.org, a website dedicated in answering questions and providing information to the County regarding recycling. Recycling and promoting sustainability is highly-regarded among all age groups and genders surveyed. The Pu‘uanahulu Landfill in Waikoloa and the Kealakehe Recycling and Transfer Station in Kailua-Kona will be closed all day on Saturday, October 14, 2017, due to road closures for the Ironman World Championship Triathlon in Kona. Regular operations at the Kealakehe Recycling and Transfer Station will resume on Sunday, October 15, 2017. The Pu‘uanahulu Landfill will resume its normal schedule and re-open on Monday, October 16, 2017. If you have any questions, please contact the Solid Waste Administrative Office at 808-961-8270. The County of Hawai‘i Department of Environmental Management announces that work to remediate the area used for scrap metal processing at the Kealakehe Recycling and Transfer Station will start on or about October 2, 2017. The project was awarded to contractor Isemoto Contracting Co., Ltd, and is anticipated to be completed by August 1, 2018. The transfer station, greenwaste, white goods, scrap metal, reuse center, HI5 redemption, and mulch pickup are not affected and will remain open. The site for e-waste collection will temporarily move to the same site as the Household Hazardous Waste collection. The Department of Environmental Management apologizes for any inconvenience the project activities may cause. For more information, please contact Gregory Goodale, Solid Waste Division Chief at 961-8515. Western states and provinces on the Pacific Ocean will gather this year in Honolulu to discuss how best to protect the West Coast from oil spills. The Hawaii Department of Health is hosting this year’s Annual Meeting of the Pacific States/British Columbia Oil Spill Task Force, comprised of Alaska, British Columbia, Washington, Oregon, California, and Hawaii. The Task Force provides a forum where members can work together to implement regional initiatives to help protect 56,600 miles of coastline stretching from Alaska to California, including the Hawaiian Islands. The meeting is taking place on Thursday, Sept. 28 from 8 a.m. to 5 p.m., in the Coral Ballroom at the Hilton Hawaiian Village. The event is open to the public and attendance is free of charge. To register, go to: https://2017taskforceannualmeeting.eventbrite.com. At this year’s event, the six Task Force jurisdictions will provide updates on their spillresponse programs, projects and initiatives. Guest presentations and panel discussions will highlight pollution prevention measures in the cruise ship industry, issue involving the clean-up of heavy oils, and the challenges with managing data during a spill. The Task Force was authorized by a Memorandum of Cooperation in 1989 by Governors of Alaska, Oregon, Washington and California, and the Premier of British Columbia following the Exxon Valdez and Nastucca oil spills. These events highlight the common concerns regarding oil spill risks shared by West Coast states and provinces, and the need for cooperation across shared borders. The Task Force is committed to improving, preventing, preparing for and responding to oil spills. It collects and shares data on spills, coordinates spill prevention projects, and promotes regulatory safeguards. The U.S. Environmental Protection Agency today announced a settlement with Fileminders of Hawaii, LLC, requiring the company to close a large-capacity cesspool at its Kapolei facility on Oahu. Cesspools can contaminate groundwater, and large-capacity cesspools have been banned since 2005. In May 2016, EPA inspected the Fileminders facility, a records storage company in the Campbell Industrial Park, and found one large-capacity cesspool (LCC) in use. EPA regulations under the Safe Drinking Water Act required closure of all existing LCCs by April 5, 2005. Fileminders, the operator of the cesspool, and Hawaii MMGD, the company’s owner, will pay a civil penalty of $122,000 for violating the Safe Drinking Water Act. In June, the cesspool was closed and the company installed an individual wastewater system. An LCC is a cesspool that serves multiple residential dwellings or a commercial facility with the capacity to serve 20 or more people per day. Cesspools collect and discharge waterborne pollutants like untreated raw sewage into the ground, where disease-causing pathogens can contaminate groundwater, streams and the ocean. Cesspools are used more widely in Hawaii than in any other state, despite the fact that 95 percent of all drinking water in Hawaii comes from groundwater sources. over 3,400 large-capacity cesspools have been closed statewide, many through voluntary compliance. The County of Hawai’i wishes to express heartfelt thanks to all of the many volunteers and sponsors for their kokua during the massive two-day clean-up of Old Kona Airport Park, to make this facility a nicer place to play for our keiki. We thank: Youth With A Mission, Hawai’i Community Correctional Center, Friends for Fitness, Debbie and John Mabuni, Council Members Karen Eoff, Maile David and Dru Kanuha, Michael Ikeda, Alexander Hill, Clint Santos, George Correa, Joey Valenzuela, Chase De Mattos, Christopher Mae, Matthew Tailon, Paul Ebel, George Kanakua, Kathleen Lacerdo, Bina Torres, Derwin Nunes III, Irene Kauwe, Gaudens Girbisi, Sr., Cynthia Hove, Barbara Krekeler, Margie Wolfe, Cristina Garcia, Kamrirg Chaz, Carlito Yadau, Noah Nehls, Jonah Nehls, Trystan Nehls-Nachor, Skibs Nehls, Katie McKillop, Celine Kitaoka, Yamile Marquez, Irie Charity, Melvin Ho‘omauawau, Lani Ho‘omauawau, Elizabeth Elkjer and Hannah Rose (Echo City Knockouts Roller Derby), Patricia Ikeda, Christopher Au, Mark Jensen, Kalae Mills, Tania Mills, Maia Mills, Isaiah Easley, Taylor Easley, Betty DeRoy, Scott Forrington, and Billy Doaner, along with numerous spontaneous anonymous volunteers who did not sign in officially. We also thank the following volunteers from Queen Lili‘uokalani Trust: Kehau Harrison, Ashley Flynn, Pelena Keeling, Lyle Gomes, Michael Shibata, Richard Teanio, Jr., Kalena Spinola, BJ Ells, Justin Murata, Bernaldo Quanan, Morgan Leleiwi, and Mana Purdy. We thank the following businesses and non-profit organizations: Sustainable Island Products, Davis Tile & Marble, Courtyard Marriott-King Kamehameha’s Kona Beach Hotel, Costco Wholesale, KTA Super Stores, Foodland, Pine Tree Café, Walmart, McDonalds, Starbucks, Royal Kona Resort, Hawai’i Sober Living & Recovery Center, Hawai’i Land Care, Tante and Aracelli Urban Foundation, Umeke’s Fish Market Bar & Grill, Chubby’s at the Avalux Café, Safeway, 808 Building Maintenance, Signature Flight Support – BBA Aviation, Bongo Ben’s Island Café, Adobo on Board, and Kohanaiki. The Department of Parks and Recreation is grateful for the assistance and support of the Hawai’i Police Department, the Department of Public Works, the Department of Environmental Management, the Civil Defense Agency, the Fire Department, the Office of the Corporation Counsel, the Department of Housing and Community Development, and the Office of the Mayor. The Hawaii State Department of Health Underground Storage Tank (UST) Section has issued a Notice of Violation against Aloha Petroleum, Ltd., the registered owner and operator of four 10,000-gallon underground storage tanks at its fuel service station located at 3203 Monsarrat Avenue in Honolulu, Hawaii. Aloha Petroleum has been cited for failing to notify the department of a suspected fuel release within 24 hours of discovery, failing to conduct a timely investigation of the release, and deficiencies related to its release detection monitoring and record keeping system. Costco Wholesale Corporation has paid a fine of $4,799.40 for violating State deposit beverage container (DBC) requirements. On April 24, 2017, the Hawaii State Department of Health (DOH) sent a Request for Information letter to Costco requesting that the company submit sales information for auditing purposes. Despite more than 15 emails and telephone calls, Costco remained non-cooperative in providing the requested information in violation of the DBC Program audit authority specified in Hawaii Revised Statutes §342G-121. DOH issued a Notice of Violation and Order (NOVO) against the company on June 13, 2017. Costco paid an administrative fine of $4,799.40 on July 12, 2017. Costco also provided the requested sales information and submitted a letter summarizing its procedure for generating sales data, satisfying the compliance requirements set forth in the NOVO. Darren Park, manager of the department’s Deposit Beverage Container Program, said it is important for wholesalers and distributors to comply with requests from the DOH which administers the “HI-5” recycling program. More than 600 million deposit beverage containers are recycled annually at certified redemption centers that otherwise would be landfilled or end up littering Hawaii’s environment. Since 2005, Hawaii’s residents have recycled nearly 8 billion deposit beverage containers through the DBC Program. The Department of Parks and Recreation will be closing the Old Airport Park in Kona from 7:00 am on Wednesday, August 9 and Thursday, August 10, 2017, to facilitate community clean-up efforts. Anyone camping at or using the park is being asked to leave prior to and during the park closure and clean up. Under Hawai‘i County Code (Section 15-39), camping in the park will not be allowed after the park clean up. “Social service agencies, County Office of Housing and Community Development, Parks and Recreation personnel, and Hawai‘i Police Department are actively making site visits, and notifying people camping at the park about transitional/emergency shelters around the island,” said Charmaine Kamaka, Director of Parks and Recreation. Various County departments, community groups, organizations and individuals are assisting with the clean-up event, and Parks and Recreation is seeking volunteers to help with clean-up efforts. If you would like to volunteer or for more information please contact Charmaine Kamaka at 961-8561 or Charmaine.Kamaka@hawaiicounty.gov. Cause of Discharge: The cause of the discharge was due to wastewater entering the Storm Drain system from a broken sewer lateral at the corner of Waiānuenue Avenue and Kino‘ole St.
Remedial Action Taken: While the discharge into the Storm Drai n system was small and estimated to be in the order of one (1) gallon per hour; the shoreline area in the vicinity of the Storm Drain discharge has been posted with Warning Signs in accordance with State of Hawai‘i, Department of Health requirements and the sign-posted area is closed to recreational activity until further notice. The Wastewater Division is testing shoreline waters in the vicinity of the discharge. Testing will continue until authorization is obtained from the State of Hawai`i, Department of Health to remove Warning Signs posted in the area. The County is currently in the process of coordinating repair of the broken sewer lateral. A three day operation last week in the Kalalau section of Kauai’s Napali Coast State Wilderness Park resulted in additional arrests and the dismantling of large, illegal camps in Kalalau Valley. Today the U.S. Environmental Protection Agency announced an agreement with the County of Hawaii to close seven large capacity cesspools (LCCs) that serve the Pahala and Naalehu communities. The County will replace the cesspools with wastewater treatment systems approved by the Hawaii Department of Health. In a separate action, EPA reached an agreement with Aloha Petroleum, Ltd. requiring the company to pay a civil penalty of $57,500 for its operation of an LCC at its Aloha Island Mart convenience store and gas station in Captain Cook on the Big Island. EPA found that Aloha Island Mart operated an illegal LCC until 2014. Aloha Petroleum has since closed the non-compliant cesspool and replaced it with an approved wastewater system. The agreement with the County of Hawaii requires the closure of two LCCs serving the Pahala community, three LCCs serving the Naalehu community, and two LCCs serving the Pahala Elderly Apartments. Combined, the seven cesspools serve about 280 households. In the Pahala and Naalehu communities, the County has developed closure and replacement plans for the cesspools. Newly-constructed secondary wastewater treatment facilities and updated collection systems will come online in 2021 for Pahala and in 2022 for Naalehu. Cesspools serving the Pahala Elderly Apartments will be closed by September 2018 and replaced with septic systems. The agreement also includes specific reporting requirements and allows for stipulated penalties should the county fail to meet agreed-upon deadlines. Construction of the new treatment and disposal facilities will be financed in part with federal grants and low-interest loans from the Clean Water State Revolving Fund loan program. Under the agreement, an additional 95 properties in the Pahala and Naalehu communities not currently served by the LCCs will also be connected to the new county sewer systems. Cesspools are used more widely in Hawaii than in any other state, despite the fact that 95 percent of all drinking water in Hawaii comes from groundwater sources. over 3,000 large capacity cesspools have been closed state-wide, many through voluntary compliance. University of Hawaiʻi at Mānoa Student Housing Services managed to gather more than 14,105 pounds of items for donation during the weekend of residence hall move-out at the end of spring 2017 semester. Nicole Chatterson (right) and Eunice Yamada led student efforts to divert 45 mini-fridges from the landfill. Students and staff juggled commencement and the end-of-semester move out rush to donate 9,554 pounds of clothes and 4,551 pounds of miscellaneous items to the Boys and Girls Club and the Kidney Foundation. In addition to these items, the UH Office of Sustainability teamed up with the Surfrider UH Club to rescue 45 abandoned mini-fridges from the waste stream. These mini-fridges will be offered to incoming student residents in fall 2017.